Hey, friends! 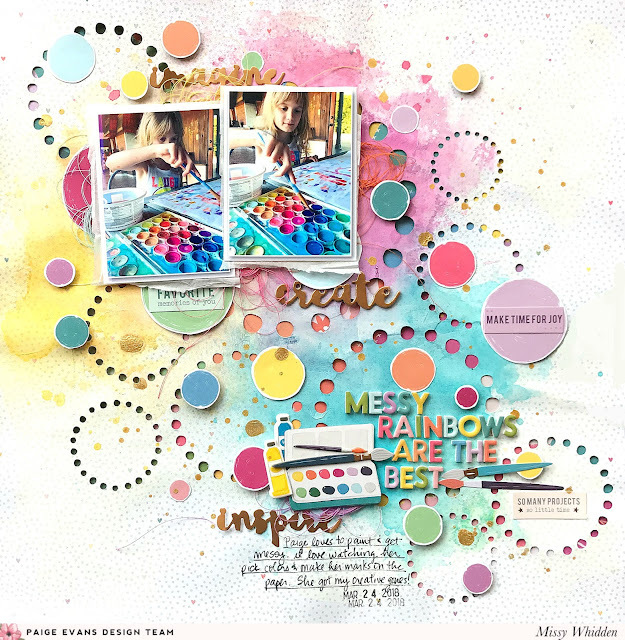 Missy Whidden here with a new layout using the Whimsical collection. I’ve been brewing ideas for using some of the fun art supplies images in this collection and I decided to scrap some cute photos of my daughter painting with her watercolors. She gets her messy tendencies from me… haha! 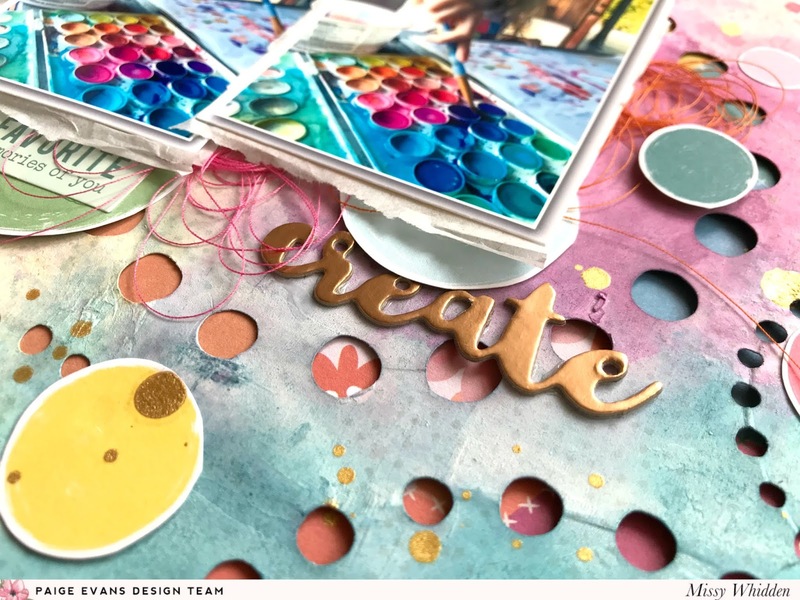 I decided to create a bright and watercolored background to match my theme and incorporate some of the adorable watercolor & paint brush pieces as embellishments. Since the watercolor paints are circles, I used Paige’s Polka Dot Circles Background cut file to create some fun detail. I cut those on Paper 21 and backed it with Paper 05, which I pulled from the 12x12 Paper Pad. 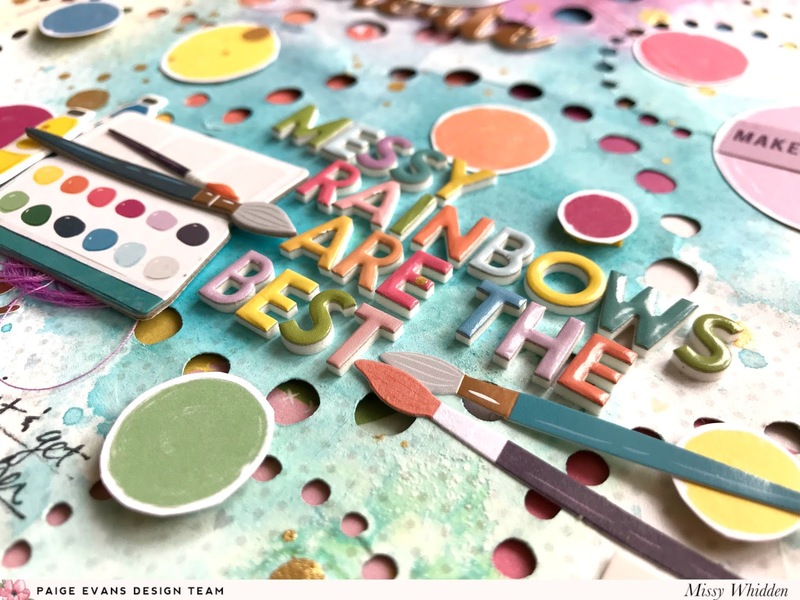 I couldn’t resist creating a rainbow mix for my title. I used the Foam Mini Thickers which are perfect for this color scheme. I used the watercolor set from the Chipboard Stickers and several paint brushes from the Chipboard Stickers, Ephemera Die Cuts, and Stickers. I can’t get over how cute these are! For an extra pop of purple, I tucked some tangled thread under the chipboard. I chose Paper 21 as my background because it has a lot of white. I cut the circles first and then coated a lot of it with white gesso. I wanted to add a lot of color on top of it, so I wanted to make sure the paper was ready to handle the liquids. I used a mix of Distress Oxides and ink sprays to create big splotches of pink, yellow, and blue. You can see more details on how I did this in my process video below. I decided to continue with the circle idea and fussy cut lots of them from Paper 20. I raised some of them off the page using adhesive foam. I added a few of the gold words from the Chipboard Stickers & Stickers in a few places. Since my photos were so bold and colorful, I didn’t do much embellishing around them. I didn’t want things to get too busy, so I just added some tangled thread in a few colors and one gold Sticker at the top. 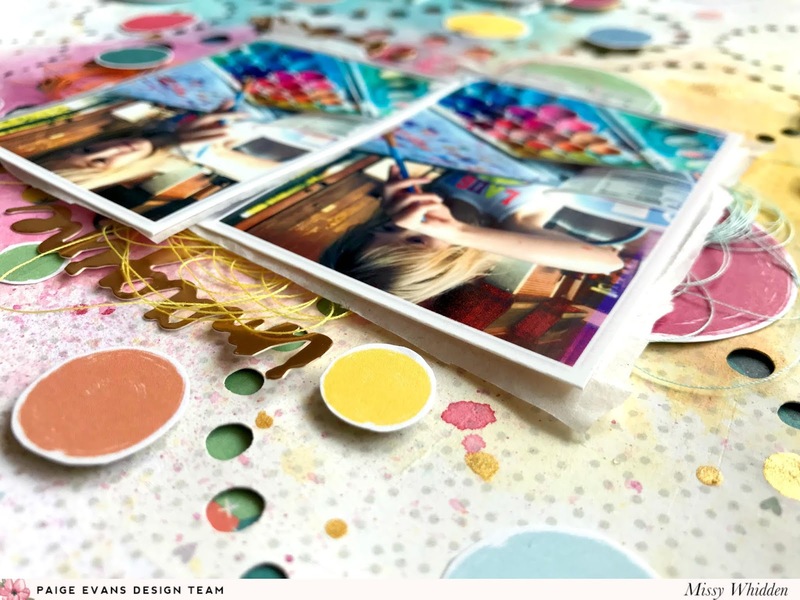 I hope this inspires you to create a fun layout about art! There are so many fun images that match that theme in this collection and it really inspired me to get a little messy on this page. Be sure to check out even more details in my process video below. Thanks so much for stopping by! This is so fun! I love all the colors, the circles and loving that you did the title in the different colors!!!! !